Powell and Pressburger's witty wartime classic about a British airman who goes to court in heaven to appeal his death is a celebration of the human spirit that separates romanticism from sentimentality. People looking for examples of how auteurs not named Tarkovsky can make great art under government constraint should look no further than Michael Powell and Emeric Pressburger. After making a run of cheery but subversive movies during World War II, always under the watchful eye of Winston Churchill -- who refused to shut down the film industry as it was during the Great War -- the Ministry of War came to them with a request: Could they make a movie that would make the British and Americans love each other? A seemingly odd request, given that the nations were at the time fighting tooth and nail to dislodge the Nazis from Western Europe. But, then, England had been lousy with GIs for years, and the effect was starting to pall: "Overpaid, oversexed, and over here," went the standard gripe about Americans. But the fact that Powell and Pressburger were able to take that deadly prescriptive assignment and then bolt it onto a rhapsody of a story about life, death, love, and all the rest of it, is nothing short of astonishing. That's one of the things intrepid viewers will learn from the best of the add-ons included in the near-perfect Criterion Blu-ray edition of A Matter of Life and Death. In a wide-ranging interview, Thelma Schoonmaker—Martin Scorsese's long-time editing collaborator and Powell's widow—rhapsodizes about the movie's many artistic merits (the edits, the humor, the Technicolor!) in between dropping little tidbits of background information. For many Criterion editions, the best reason to get them is to enjoy seeing the movie in as pristine condition as possible. In this case, it's a beaut, Sony's painstaking 4K restoration wipes away all the decades' of blur and decay to reveal the bright, almost hallucinogenic quality of Jack Cardiff's spectacular Technicolor cinematography. Such glories aside, it helps having a guide like Schoonmaker. Otherwise, you just might wonder what Powell and Pressburger are doing in that jury trial in heaven and why they're spending so much time on a long-dead colonial griping about the Brits in the afterlife. Not that it will matter much, because chances are by that point you will have long before surrendered to the movie's charms. Not so much with the twinkly opening sequence, which pans lugubriously across a star field while the narrator natters on ("This is the universe—big, isn't it?") before swooping down on wartime Europe. It's the night of a massive bombing raid in 1945 and a smashed-up burning Lancaster bomber is racketing home through some classically British pea-soup fog. 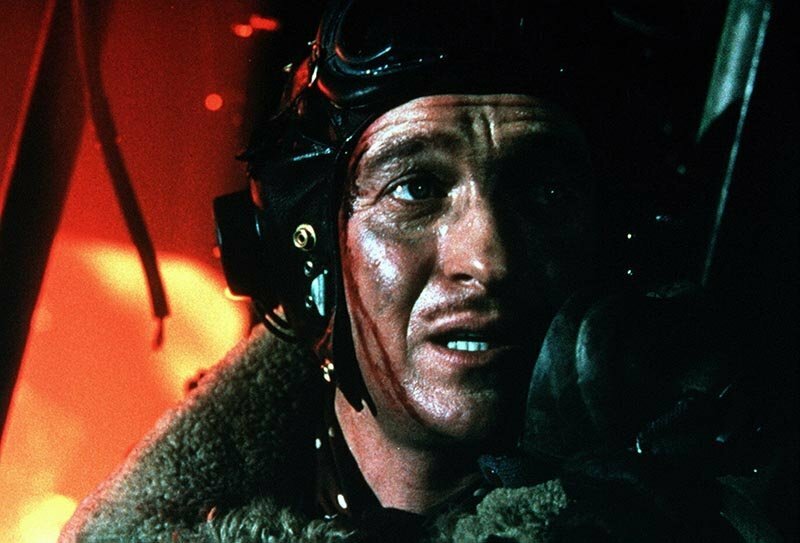 On board, Peter Carter (David Niven, spry and wittily lyrical), an officer with his classically British stiff upper lip is giving the control tower some bring-of-death josh as identification. ("Politics: conservative by nature, Labour by experience.") He then recites some Sir Walter Raleigh and gets to the business at hand: "I can't give you my position. Instruments gone. Crew gone. Except Bob, he's dead"—the bloodied body at his feet in the shattered fuselage—"They'll be sorry about Bob. We liked him." All the while that Carter is carrying on, the woman on the other end of the radio, an American operator named June (Kim Hunter), is becoming increasingly despondent. In the seconds they've been batting dialogue back and forth, a resplendently rich red light glowing behind her and her eyes sparkling with tears while Carter's twinkle in a merry sadness, they've fallen for each other. "I could love a man like you, Peter." Before he leaps from the burning plane, sans parachute, he says "I love you June, you're life." In those few short minutes, Powell and Pressburger sculpted one of the single most excruciatingly romantic sequences ever put on film. And that's before they even get to the heart of the story. First, we follow Bob (Robert Coote) to heaven, a bright and dull, rather smoothly run bureaucracy whose brusque and unfussy nature can be seen later in everything from Tim Burton'sBeetlejuice (1988) to Lee Unkrich and Adrian Molina's Coco (2017). (In a neat twist on the expected, heaven is shot in crisp black and white while the lavish Technicolor tones are reserved for Earth.) Bob's waiting for Carter, who it turns out apparently didn't die after all, but washed up on a beach just in time to run into June. But for a slip-up in the afterlife's paperwork, Carter would have been issued his wings in heaven instead of lavishing attention on his beloved and trying to decide whether he's going mad or not. Unlike most romances, Carter and June are united rather quickly. They have a grand time of their first flush of love. 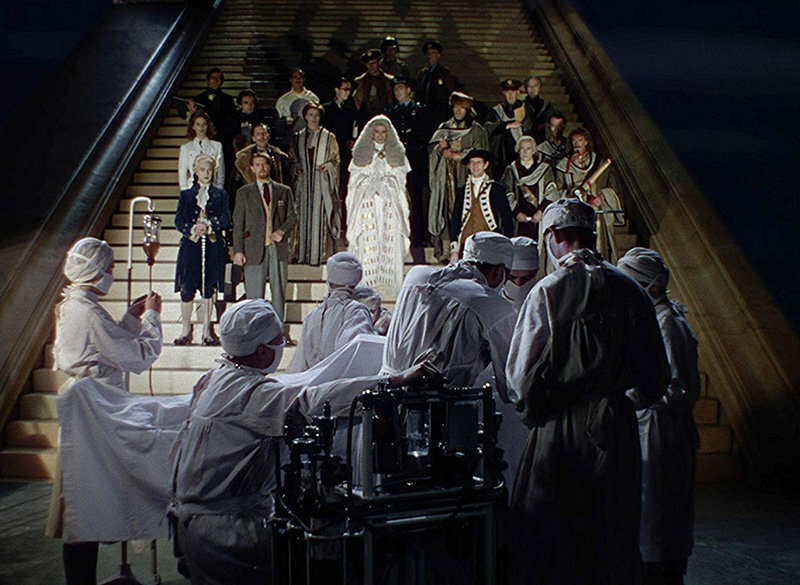 So do Powell and Pressburger, who seem content to stud their light-hearted ("Stupidity has saved many a man from going mad") yet thoughtful screenplay with Cardiff's eye-popping colors, their attention-grabbing bravura editing, and a rich production design. The crux of the movie concerns the efforts by heaven's bureaucrats, upset that one Conductor 71 (Marius Goring, deploying a foppy French shtick as outrageously entertaining as a drag queen production of Vincente Minnelli's Gigi) to get Carter back into the land of the happily dead. After failing to trick him back upstairs—the way up an actual massive staircase to the stars, lined with statues of everyone from Lincoln to Aristotle—takes the form of a celestial trial in which Carter appeals for the right to be, well, not dead. 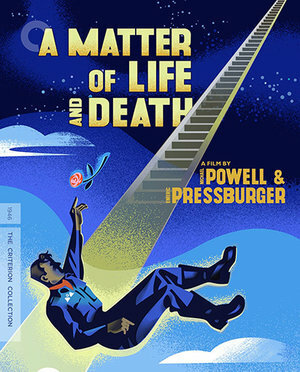 Rather incredibly for a wartime film that hit theaters when the ashes of bomb craters in London were practically still smoking, Powell and Pressburger take a somewhat nonchalant view of death. The departed souls streaming into heaven, a good number of whom have come straight from the battlefields of Europe, are uniformly calm and at ease. Perhaps this reflects an unwillingness to burden a wartime audience with morbidity; indeed, the movie was released in America as Straight to Heaven so as to not use the word "Death". More likely they didn't want to burden what is ultimately a fantasia, albeit a thoughtful one, about humanity's common interests. There are no angels in their conception of heaven. No God, either. (One can easily imagine the furor that would come from certain quarters were such a thing tried today.) But there is poetry. And a rich evocation of romantic love that is somehow devoid of sentimentality. Not surprisingly, the court scene, while audaciously strange, is the least engaging part of the story. When Carter finally takes the stand, his body back on Earth is being operated on at the urging of a doctor (Roger Livesey) who, with his pronouncements about seizures and brain science, plays the same role as Man of Scientific Exposition from any number of sci-fi movies that would be hitting theaters in a few years. Carter's opposing counsel is one Abraham Farlan (Raymond Massey in full-throated roar), a Revolutionary War veteran who has it in for anyone British. He even packs the jury with all the nations (American, Irish, Chinese, Punjab) who have bones to pick with the United Kingdom. The gag is that when the judge agrees to replace the jury, the new members are the same men and ethnicity, only now Americans without any grudges, simultaneously singing praise to the American melting pot and illustrating the undying strength of the Special Relationship. It's a hard pill to swallow dramatically, but the powerful strangeness of the scene's conceit and the epic grandeur with which it was filmed help it go down. In his short but sparky interview on the Criterion disc, Scorsese acknowledged what Powell and Pressburger were making during the war years—particularly thrillers like Michael Powell's 1941 film, The 49th Parallel: "It was propaganda, but in the best sense." Marty's argument, weighted by his being an early Powell-Pressburger obsessive, was in essence, So what if their marching orders came down from the Ministry of War? If the result is something like A Matter of Life and Death, then bring on the propaganda.